Recently, I've been re-watching Pushing Daisies. If you haven't ever seen that show, I recommend it. 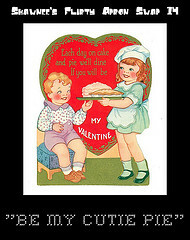 It's about the handsome Pie Maker and a special gift he possesses. It combines a few of my favorite things: solving mysteries, baking, and occasionally breaking out into song. Sadly, it's only 2 seasons long. The reason I bring this is up is because towards the end of the first season the adorable leading lady suggests to the Pie Maker that they make "cup pies" or individual servings of pies. I thought "Man, she is a lady after my own heart!" It makes me love the show even more. Also, the pilot episode was cleverly dubbed "Pie-Lette." So cute. On top of that, I've join this month's Flirty Apron Swap! The theme is "Be my Cutie Pie." ... Pie-Lette, Cup Pies, Cutie Pie! SO MUCH PIE! 2. Using a 2″-3″ circle cookie cutter, cut out circles in the bread. I was able to get 2 per slice. 3. 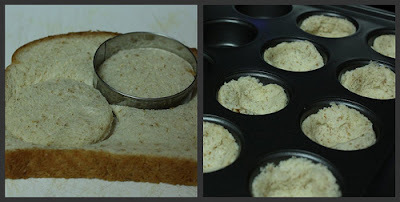 Press each circle into a mini muffin pan, making sure it’s pressed well against the edges to form into a good crust. 4. Brush melted butter on the tops of the crusts. 5. Combine sugar and cinnamon. Sprinkle liberally over the buttered crusts. 6. Bake for 5-8 minutes, until the crusts brown. Allow to cool. 7. To make the apple filling, melt the 1/2 stick butter in a small pot and add apples. Then, add brown sugar, cinnamon and nutmeg. Cook down for about 5 minutes on low/med-low heat. Add flour to thicken the sauce and cook another 5 minutes or until tender. Allow to cool until apple filling is just warm. 8. To assemble the bites, add about 2 tsp. of ice cream to each of the crusts (just eyeball it). Add a tsp. 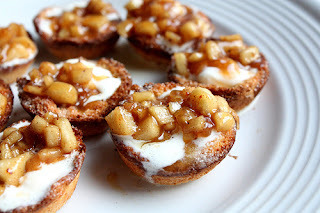 of apple filling and then drizzle with caramel sundae topping. 9. Eat all 24 in one sitting. P.S. Here's the badge for the swap. Check it out if you are interested! There are couple more days to sign up. P.P.S. The site makeover...Like? Dislike? I LOVE! Hello my name is Amy and I'm a swapaholic. Root Beer Float Cupcakes and A GIVEAWAY!